The other day we found a special gift in our driveway. 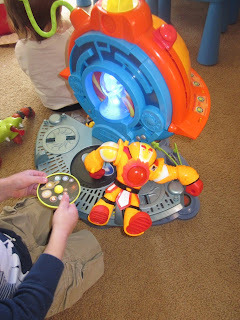 Two of Z's very good friends (brothers M and Z) left him their Planet Hero Solar Lab and Sun Commander Toy. These are two toys that Z treasured every time he went over to M and Z's house and even though M and Z had outgrown Planet Heroes, they would play with them just for Z. When the boys mom suggested that they get rid the Solar Lab to make room for their other things, they asked if they could give it to my Z (along with Sun Commander. Z and I were so touched by this gesture. It was as if Christmas came in April this year. Z has spent hours in his room with these two new toys and can't believe that the boys would give him such a special gift. Z made a very big thank you note (he told me it had to be big) and we dropped it off yesterday with some books I pulled out of the yard sale for them. Thanks M and Z for being such wonderful boys and such good friends to Z. Your simple act of kindness meant the world to us.